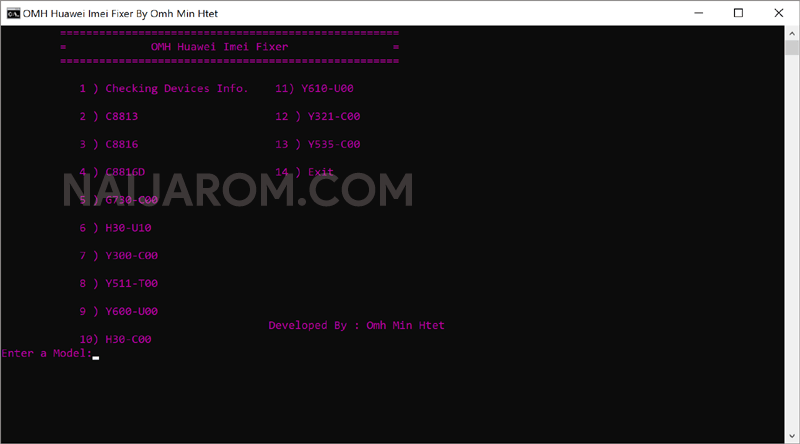 OMH Huawei IMEI Fixer V1 is a small application for windows computer which allows you to fix the IMEI issue in various Huawei Smartphone and Tablets in the World. It helps to fix the IMEI in Huawei C8813, Huawei C8816, Huawei C8816D, Huawei G730-C00, Huawei H30-U10, Huawei Y300-C00, Huawei Y511-T00, Huawei Y600-U00, Huawei H30-C00, Huawei Y610-U00, Huawei Y321-C00, Huawei Y535-C00. In order to use the Application, you need to connect your Huawei device to the Computer with USB debugging enabled. Once your device is detected by the computer Select the Model number of your Huawei device from the list and enter the number as per the model number and you are done. [*] Credits: OMH Huawei IMEI Fixer V1 is created and distributed by OMH Min Htet (developer). So, full credits goes to OMH Min Htet (developer) for sharing the tool for free.